Here is a trade I didn't take even though I had good reason because of the fib cluster and for those of you using MTP there was a DP. It would have been short from the 854 area. If I had paid attention to Rich's numbers we had a 95% chance of getting at least a 1 tick decline which would have been 850.25. And knowing that it would have given me enough reason to take the trade. BTW it was in the premarket session. c) If the instrument gaps up at the opening above the Sell Short Day High, the odds are extremely high that this gap will be filled. Therefore Selling Short should be taken into consideration. This has been a rare occurrence in the last year. Today was a perfect examples of a Buy day. Most of the decline was done on the SS day. So this morning we gaped open below the SS day low. Typical Buy day violation of the SS day low and we should be looking for any excuse to go long.The low on ES this morning was at the 23.6% retracement of the big move up since the Mar 6 low. We were also in the middle of the DP zone. If you missed the first chance to get in we had a second chance 1 hour later. Could you post a screen shot to go with your post of the 21st for us newbies please. As you can see the green box represent the DP zone from the low on the left. 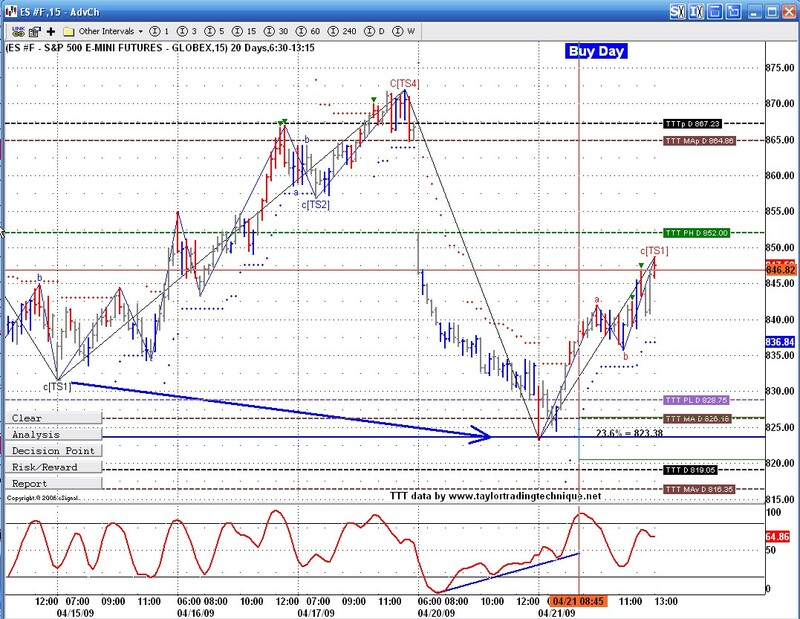 The blue line is the 23.6 retracement and we had divergence on the stochastic. We were also on between the 2 TTT average decline levels. What is the start time for your chart? Today is a Sell day. We know that the average Rally should take us to 853 to 860 levels. Just before the open this morning ES had retrace 50% of yesterday's move up and was in the DP zone of the overnight low. We also had divergence on the stochastic. Today I believe was a Sell Day according to the count here, understand there is no short sale as per Taylor but longs can be taken if prices go below Buy Day low. The Decline on the Buy day was very small and even ES day session failed to get one. Sell days are often confusing days, meaning Up and Down days. Today was no different and as mentioned on Friday's report I expected that ES would decline to the previous SS day high and create a delayed decline. The rest of the day just proved to be the confusing type sell days. 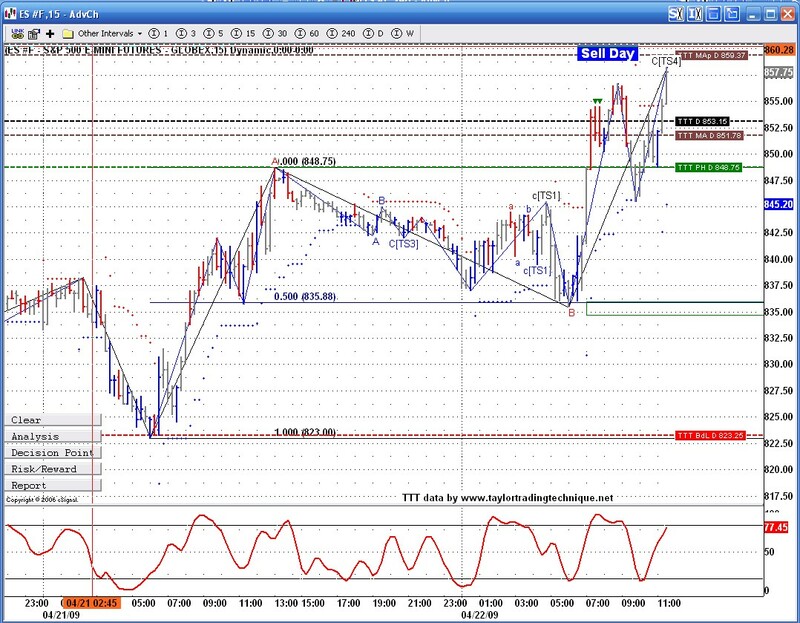 If we want to trade the TTT rules then there was not much trading to be done today. However we can always use other methods based on the price action to trade, when the markets are not doing what they are suppose to do. o.k I thought you guys go strictly by TTT rules, yesterday market went up and down nearly 14-15pt, so was wondering if other tools are used to gain entry. Today would be a Short Sale Day, and since Sell day close was weak, guess market could open weak, hence no short sale.